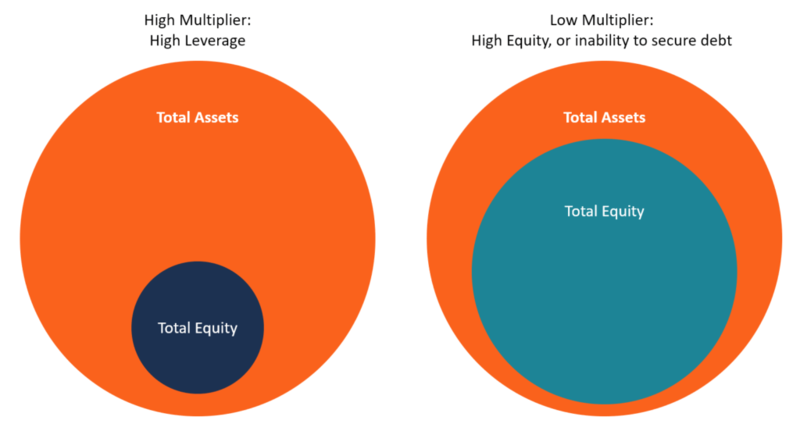 Equity multiplier is a leverage ratio that measures the portion of company’s assetsTypes of AssetsCommon types of assets include: current, non-current, physical, intangible, operating and non-operating. Correctly identifying and classifying the types of assets is critical to the survival of a company, specifically its solvency and risk. An asset is a resource controlled by a company which future economic benefit that are financed by equityStockholders EquityStockholders Equity (also known as Shareholders Equity) is an account on a company's balance sheet that consists of share capital plus retained earnings. It also represents the residual value of assets minus liabilities. By rearranging the original accounting equation, we get Stockholders Equity = Assets – Liabilities. It is calculated by dividing the company’s total assets by the total shareholder equity. The equity multiplier is also used to indicate the level of debt financing that a firm has used to acquire assets and maintain operations. A high multiplier indicates that a significant portion of a firm’s assets are financed by debt, while a low multiplier shows that either the firm is unable to obtain debt from lenders or the management is avoiding the use of debt to purchase assets. Like other financial leverage ratiosLeverage RatiosA leverage ratio indicates the level of debt incurred by a business entity against several other accounts in its balance sheet, income statement, or cash flow statement. Leverage ratios include debt/equity, debt/capital, debt/assets, debt/EBITDA, and interest coverage. This guide has exmaples and Excel template, the equity multiplier can show the amount of risk that a company poses to creditorsTop Banks in the USAAccording to the US Federal Deposit Insurance Corporation, there were 6,799 FDIC-insured commercial banks in the USA as of February 2014. The country's central bank is the Federal Reserve Bank, which came into existence after the passage of the Federal Reserve Act in 1913. In fact, creditors and investors interested in investing in a company use this ratio to determine how leveraged a company is. For example, a company that relies too heavily on debt financing will incur high debt service charges and will be forced to raise additional cash flows to meet its obligations or maintain its operations. The company may also be unable to obtain further financing to expand its market reach. When a firm is primarily funded using debt, it is considered highly leveraged, and therefore investors and creditors may be reluctant to advance financing to the company. A higher asset to equity ratio shows that the current shareholders own fewer assets that the current creditors. A lower multiplier is considered more favorable because such companies are less dependent on debt financing and do not need to use additional cash flows to service debts like highly leveraged firms do. To explain leverage analysis, we use the example of Apple Inc. and Verizon Communications Inc. In March 2016, Apple’s total assets stood at $305 billion while the value of the shareholder’s equity stood at $130 billion. The equity multiplier ratio, in this case, is 2.346 ($305/$130). As of March 2016, Verizon’s total assets were $245 billion while the value of shareholder equity stood at $19 billion. The equity multiplier ratio for Verizon is 12.895 ($245/$19). Apple’s equity multiplier ratio is lower than Verizon’s. Apple, an established and successful blue-chip company, enjoys less leverage and can comfortably service its debts. Due to the nature of its business, Apple is more vulnerable to evolving industry standards than other telecommunications companies. On the other hand, Verizon’s multiplier risk is high, meaning that it is heavily dependent on debt financing and other liabilities. The company’s proportion of equity is low, and therefore, depends mainly on debt to finance its operations. The values for the total assets and the shareholder’s equity are available on the balance sheet and can be calculated by anyone with access to the company’s annual financial reports. ABC Company reports a low equity multiplier ratio of $1.25. It shows that the company faces less leverage since a large portion of the assets are financed using equity, and only a small portion is financed by debt. ABC Company only uses 20% debt to finance the assets [(1,000,000 – 800,000) / 1,000,000 x 100). The company’s asset financing structure is conservative, and therefore, creditors would be willing to advance debt to ABC Company. Both the debt ratio and equity multiplier are used to measure a company’s level of debt. Companies finance their assets through debt and equity, which form the foundation of both formulas. In the formula above, there is a direct relationship between ROE and the equity multiplier. Any increase in the value of the equity multiplier results in an increase in ROE. A high equity multiplier shows that the company incurs a higher level of debt in its capital structure and it reduces the overall cost of capital. Financial Analysis Ratios GlossaryFinancial Analysis Ratios GlossaryBelow is a glossary of terms and definitions for the most common financial analysis ratios terms. When calculating financial ratios using vertical and horizontal analysis, and ultimately the pyramid of ratios, it's important to have a solid understanding of important terms.